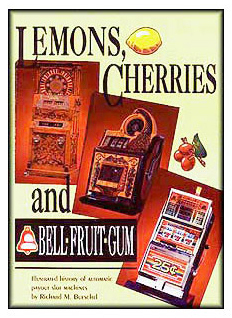 100 Years of Slot Machine History from an advertising perspective. Literally decades went into research for this very valuable book. Within the 344 pages are hundreds of photos, trade show handouts, service manual illustrations, and color brochures showing off every sort of slot machine one could possibly imagine. Each ten-year period from 1885 to 1995 is represented by a separate color-coded section. NO COLLECTOR SHOULD BE WITHOUT THIS INCREDIBLE BOOK! $39.95 plus $6.00 shipping and handling (U.S. only). SPECIAL LIMITED EDITION - LEATHER COVER $75.00 plus $6.00 shipping and handling (U.S. only).